Sure the market seems big but what can you address? Bottom-up: If top-down is about what others are making in revenues you need to find what exactly are the customers spending. Say if you see analyst report that fitness apparel revenues will reach $70 billion by 2016 you need check who is spending, how much and from what budget to generate that kind of revenue projection. Many sources are available including census.gov. You need to reconcile what you see as revenue with what you see from customer spend checking if the revenue projections are matched with customer spend. Your Reach: Sure you can stop with the two but can you reach the identified market with your product, channels and limited resources? This is the hard part and requires you to make strategic decisions to define the segment you can successfully serve better than any other competition. For instance, there are indeed 30 million public toilets in USA but can you serve all of them with your $1500 designer hand dryer? 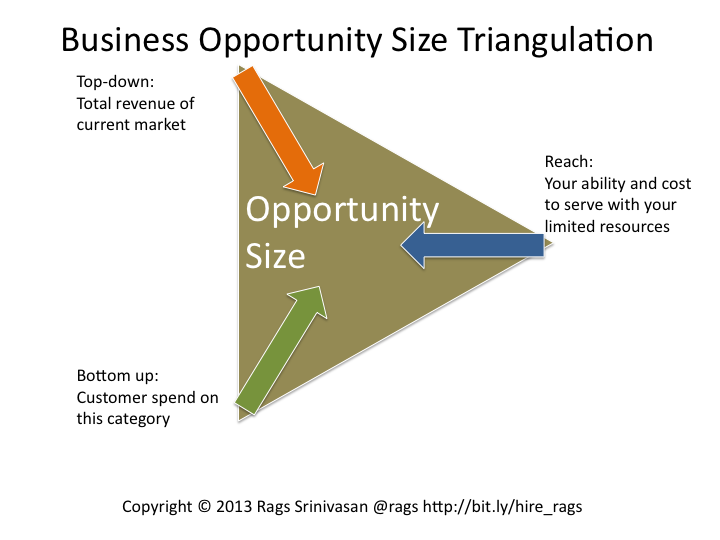 If you need help sizing your startup’s opportunity, let us talk (I have square device don’t worry).